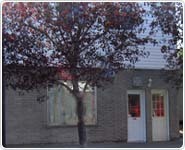 M & R Jewellery, located in downtown Gore Bay, Manitoulin Island. M & R Jewellery provides our customers with more than just gold and silver jewellery. We carry a full line of Jewellery in gold and silver, as well as a large selection of giftware and souveniers. We also provide on premises engraving services, gold repairs, and a bridal registry. M & R Jewellery, the one and only jewellery store in Gore Bay, was established in 1969 by Marv & Rhea Woods. The store remains in the family, now owned by Jim & Vanesa Jo Woods. The original store operated out of a 12' x 30' building, and in 1999 Jim & Jo built a new building, enlarging the store to 21'x 60'. One of our newest products, Gordon Ramsay quality cookware and tableware, is a porcelain product with a clasic look and is dishwasher and microwave safe. Crossroads candles and reed diffusers are high quality very fragrant scents. Buttered Maple Syrup is the most popular scent. Clayworks pottery is made in London, Ontario, Canada. We carry a variety of Nuco charms. Get a custom Manitoulin Island or MSS charm. We have a wide selection of Willow Tree figures and angels. Inspirational wall art. Apply to your walls to give your home a personal touch. Broken necklace, ring need resized, bring it in. We are a jewellery repair depot. Come in and browse to see our stock. If we don't have it, ask. We provide on-site engraving services for your engraving needs: plaques, plates, and trophies. We will wrap any gift you buy free of charge.